Virtual Private Network, popularly known as VPN is used widely these days. The users are getting more concerned about internet privacy and this is the reason why most of the internet users are switching towards the VPN. Google Chrome is one of the most popular web browsers used all around the world. Google Chrome lacks its own VPN and this is the reason why most of the people using it are going for the VPN extensions. If you are the regular Chrome user, and looking for the best VPN extensions for Google Chrome then you must follow this post. These VPN extensions can serve the purpose of both individuals and business organizations by securing their networks and allowing them to access any website on the internet by circumventing the geographical restrictions. Let’s have a look at some of the best VPN extensions for Google Chrome. 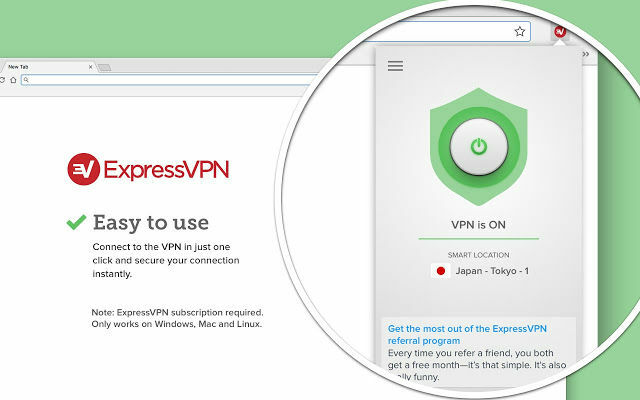 ExpressVPN‘s Chrome VPN Browser Extension features fast servers in 94 countries, perfect for unblocking content on Chrome from around the globe. In addition, it’s ideal for getting around local censorship. Encryption is military grade withOpenVPN implemented to a very high standard. The VPN software is easy to use on all platforms and runs like a dream. With 24/7 live chat support, ExpressVPN is always ready to help. The support team is extremely knowledgeable. This VPN has a 30-day money-back guarantee, so you can test it thoroughly to see if you enjoy the service. It’s a first-class, premium VPN provider that supplies customers with unlimited bandwidth, speed, freedom, anonymity, and security when they need to access the web. Surfshark offers a five star, premium VPN service that’s perfect for travelers or anyone who seeks complete anonymity when they access the internet. Fast content delivery is provided by a first-class system of over 500 servers that are strategically placed in 50 different countries so that customers can access blocked websites and services or just surf the web and know that their data is encrypted and completely secure. A light and easy setup is combined with fast server speeds to provide users with the best private internet browsing experience possible. OpenVPN and IKEv2 security protocols as well as AES 256-bit network traffic encryption are utilized to protect customers’ data when using unsecured public Wi-Fi. Surfshark VPN chrome extension is reliable and easy to set up. Came up in the year 2014, Dot VPN has been popular ever since. It is about to reach million installs on Chrome Store having an average rating of 4 stars from more than 5k reviews. It is one of the best VPN extensions for Chrome users. You can switch between servers in 12 different locations around the globe getting unlimited bandwidth for data streaming. It uses 4096-bit key encryption making it the most secure VPNs for Chrome. Hoxx VPN is another reliable VPN provider that puts least constraints on its free version. You can use unlimited bandwidth and make unlimited switches between 50 server locations. Moreover, you get 1024-bit end-to-end encryption and a static IP with every connection. You can upgrade to its premium plan and get access to faster servers, more locations, and 4096-bit encryption with premium support. Operated by Anchor Free, Hotspot Shield is a new entrant on the Google Chrome Store. It is the most reliable VPN extension and is available for all the major platforms. It offers unlimited bandwidth to all the users installing this extension. Moreover, it has high-speed servers in some of the major countries of the world including USA, UK, Netherlands, and over 85+ countries. Its premium version guarantees more security and enthralls you with extra features. Once you install Browsec VPN extension for Chrome, you can access any website from anywhere in the world. Its advanced privacy protection guards you against the data theft. You can access 4 different locations with it and utilize unlimited bandwidth for free. It’s superfast and easy to use. And the best part is you don’t require signing up for using its free VPN service. You can upgrade to premium plan for $3.33/month and have access to more features. The Safer VPN is one of the bets options for the people who don’t use a VPN service extensively. It offers 500MB bandwidth every month for free allowing you to access all premium features with access of 30 servers located at different locations. It uses 256-Bit encryption, inbuilt automatic problem fixer, multiple protocols, and has a strict ‘No-Logs’ policy. You can upgrade to its pro plan at $5.59/month to utilize unlimited bandwidth. These were some of the best VPN extensions for Chrome users. You can install any of these on your Chrome browser and stay protected while accessing any website on the internet. These VPN extensions allow you to browse any geo-restricted website without worrying about getting caught. Moreover, the anonymous browsing makes it fun to navigate through the web.